The Hatch D1 is a spacious police gear bag with room to carry or store all the police equipment essential to your job, plus water resistant construction to keep all your duty gear protected! 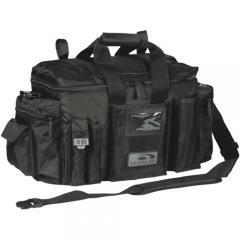 The Hatch D1 law enforcement gear bag is constructed with 840 denier, water resistant nylon with PVC backing and features high quality hardware, such as heavy-duty zippers and removable nylon web shoulder strap. The spacious interior compartment has an adjustable divider and removable rigid bottom, two zippered cargo pockets and 6 pen/pencil pockets. The exterior features two zippered cargo pockets, two flip-top pockets, and three open-top pockets. VELCRO® straps on the padded top can secure a baton or flashlight. Exactly what I needed and wanted. Lots of space. No clutter. Easily accessible. Great bag, looks good and feels like its made right. Lots of pockets and places to store your gear. Wish it had a bit more room for folders and clipboards and stuff, but otherwise its worth it. Perfect for the recent police academy graduate. Great patrol bag. Only frustration is the seat strap is too short. Had mine for just over 12 years and it still has lots of life left. Aside from usual and expected wear and tear, it's in great condition and all zippers are working just fine. Highly recommend it. Excellent bag, fits all my gear and then some. Extremely well made and durable. I've used the bag for about a week now and my initial thoughts, a few things I miss. Webbing on the top of the bag, or open spaces would be handy for add ons, the back that is flat could use a zippered pouch with dividers for documents and paperwork. But the bag does hold all of my kit and I still have some room I'm trying to fill. The top flap has a hard crease which keeps the bag open when in the car, very nice to have. Seems like good strong material so far, however, I haven't beat it up too much yet. Smaller than I expected. I returned this item. Found bigger bags for less money. Amazing. Many pockets and storage spaces. Great investment for the price. These are exactly what we Needed for our Hazard Responders. All the previous bags who split at the seams or where the straps were. These are super sturdy and have lots of hidey holes for gear. Perfect size and lots of pockets. Great bag to have in your patrol car Best bag for the money. Love it. Room for everything. Absolutely one of the best bags out there. With this on your shoulder there is no second guessing if you remembered to grab everything, cause there's room for ALL OF IT. Written by: Michael H. South East Tex. I love this bag. It holds all my stuff for patrol. Extra cuffs, pens, pro tractor, paperwork, wind breaker, ammo, IFAC, Patrol rifle mags, extra flash light, baton, hell I ran outta stuff to put in it. It is just the right size and it is very well built Plenty of side pockets. Does a great job holding all my gear I need for the road. Great bag fits all my gear. It's made with quality no complaints.